May 8, 2018 - IFS, the global enterprise applications company, announces the launch of a new proof of concept - developed by the company’s innovation think tank, IFS Labs, in collaboration with fountx and its Australian parent company, TAE Aerospace - to change the way that companies maintain complex assets. IFS Labs has developed an integration between enterprise applications suite IFS Applications and fountx wearable assisted reality technology. 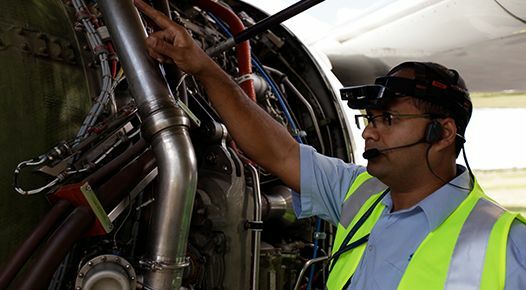 The proof of concept, which is being trialled at TAE Aerospace, lets maintenance technicians visualise IFS software data related to the asset they are servicing on the fountx near-eye display. This way, technicians can keep their hands free, with no need for printed job sheets or separate computing devices. They can also record HD images from the fountx camera directly into IFS Applications. Unlike wearable consumer technology, fountx is purpose-built for complex industrial environments, preserving the spatial awareness users need to work safely. It comes in two parts: an operator station, comprising a lightweight near-eye headset and wearable computer; and a touchscreen expert station used off-site. These allow technicians to perform complex maintenance with an expert looking over their shoulder - virtually. For example, TAE Aerospace is looking to enhance the remote support system for the turbine test cells it develops, builds and supports for its clients. With IFS Applications and fountx, technicians could access information to perform triage, order parts in the field, and upload billing information in real time as they work.